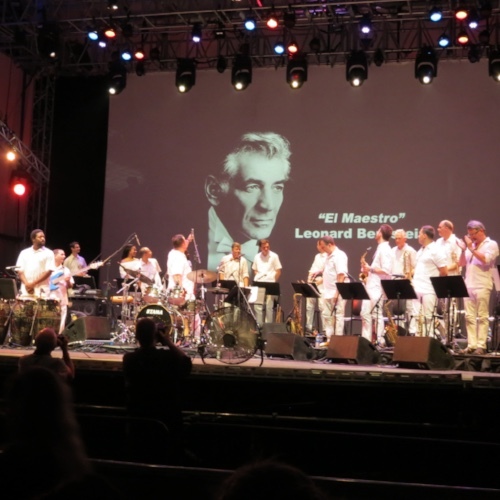 It was an old fashioned Palladium party last night (8-10-18) in San Juan Hill aka Damrosch Park as maestro Bobby Sanabria celebrated maestro Leonard Bernstein with a powerful performance of his West Side Story Reimagined with his Multiverse Big Band that features some of the finest players from NYC, Puerto Rico, Cuba, The Dominican Republic, Japan and more. There was poetry from La Bruja (who reminded everyone that the opening scenes for the film West Side Story were shot in that very location where Lincoln Center stands now) and Rich Villar, a great multi-media photo slide show of vintage photographs of legendary Latin musicians, the old neighborhoods of San Juan Hill, the South Bronx and El Bario that were projected on a big screen behind the band. Supreme court Justice Sonia Sotomayor was also in attendance.